Welcome to DASEG. 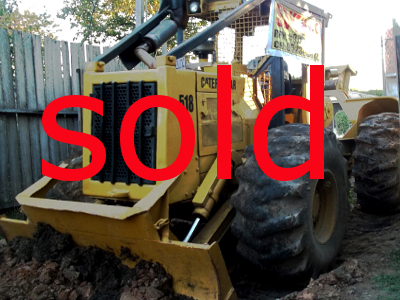 We’re pleased to offer you quality second hand machinery, whether you are in the forestry, construction or agriculture sector. 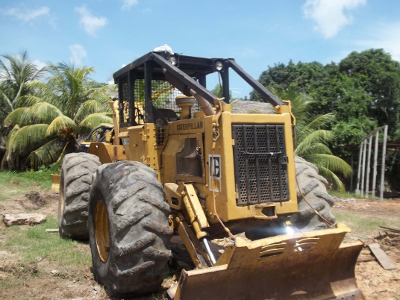 We’re a Peruvian company with years of experience in providing heavy machinery, and on our site you are likely to see Caterpillar, John Deere and other quality brands. 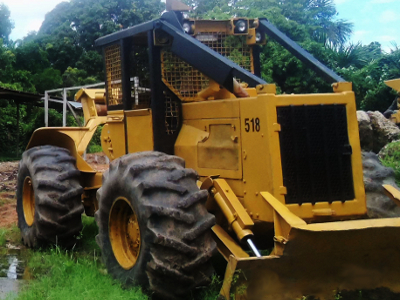 The following description applies to a typical CAT 518 log skidder model, but the actual equipment might vary due to model differences and, customizations, and usage. The CAT 518 power shift transmission provides fast cycling and easy shifting. Precise shifting modulation reduces stress on axle shafts. The CAT 518 log skidder is equipped with the proven fuel efficient CAT 3304 Diesel engine designed for less strain and a long life. Optional axels, for flotation tires and dials allow work in marginal areas or extend the working seasons for more production. The CAT NoSPIN differentials in front and rear ensure excellent traction automatically, with no manual control needed. Operator confidence and productivity in all types of terrain are enhanced with the availability of 2 standard breaking systems. CAT 518 skidder tools are designed for superior balance and productivity, proven in tough skidding applications. The CAT 518 log skidder model provides excellent visibility in all direction thus enhancing operator confidence and increasing production. The precise low-effort controls in the cabin are grouped for operator efficiency. The optional suspended, adjustable seat is angled at 15 degrees for operator’s ease. The primary safety feature is a durable rollover protective structure with sweeps, steel mesh screens, grab iron, plus level uncluttered floor for easy entry exit into a comfortable, productive environment. A CAT 518 skidder typically has reliable Dozer blade log ejectors ensuring more production time and less downtime. The CAT 518 log skidder requires minimal service with considerably less time required on maintenance as compared to the competition. No daily lubrication is required and the engine and parts have easy access. Planetary reduction final drives on all wheels are mounted for servicing ease. This model is designed for superior durability as it has a fabricated, box-section frame design with integral, fabricated cross member and belly guard. 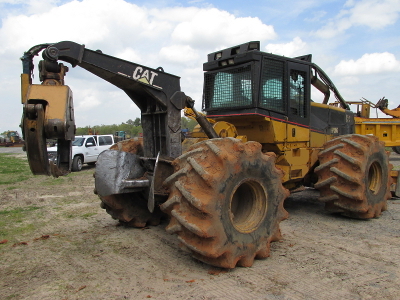 A CAT 525B is a powerful mid-range grapple skidder. The CAT 525B is faster and more powerful than most competing skidders of similar specifications. This model is designed for fast easy daily service checks, and a long machine life. 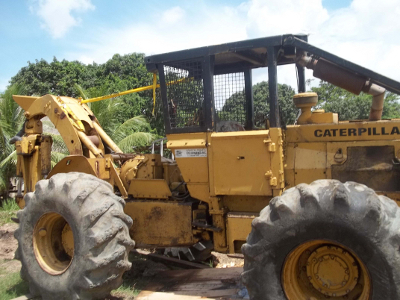 A CAT 525B can be fitted with either flotation or dual tires, making it a very versatile piece of equipment. The CAT 525B is powered by a six cylinder, four stroke Cat 3126 DITA diesel engine delivering more torque than previous CAT skidder models. The engine uses a direct-injection system and efficient and reliable adjustment-free unit fuel injectors. The CAT 525B series wheel skidders use a weight-forward design for better fore-aft support and exceptional stability on grades, even with large loads. High-capacity grapples take advantage of the greater loading forces made possible by the Load- Sensing Hydraulic System. They also benefit from excellent stability (a result of the long wheel base and oscillating front axle). The modern ergonomic cab sets an industry standard for reducing operator fatigue, which means improved operator efficiency and productivity. The dash is automotivestyle, and the half-wheel steering control tilts and telescopes to accommodate any size operator. The modular ROPS cab mounts resiliently to the frame, isolating the cab from most vibration.